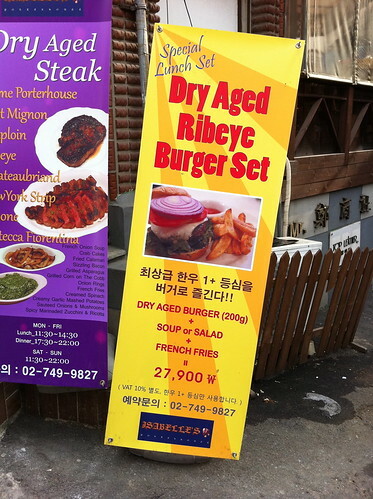 Paul Ajosshi: The Most Expensive Burger In Itaewon? Isabelle's Porterhouse is offering a new lunch set menu with a dry aged burger, soup/salad and fries for the rather hefty sum of 27,900 won. I think someone should call them out, as they're likely not using dry aged but WET aged beef. It's highly difficult to do dry aged beef, and I highly doubt they have the equipment and skills for it. You're the man to do it Joe. My past experiences there have included a certain amount of creative license with menu descriptions on their part, so I wouldn't be surprised to learn it was wet aged beef.